Release Date: March 8, 2080. Henry M. Hanson, 92, of Waverly, Iowa passed away on Wednesday, March 8, 2017 at the Bartels Lutheran Retirement Community in Waverly. Henry Morley Hanson was born on July 3, 1924, the son of Henry Martin and Olga Marie (Bjorsness) Hanson in Warren, Minnesota. He was baptized and confirmed in Warren, Minnesota. He graduated from Warren High School and then attended St. Olaf College. He enlisted in the V-12 program while at St. Olaf and was transferred to Navy V-12 at the University of Dubuque. Henry then went on to medical school at Northwestern University. On November 13, 1948, he was united in marriage to Joan Kessler in Chicago, Illinois. After medical school, he was inducted into the US Airforce and served from July 1, 1951 until June of 1953. 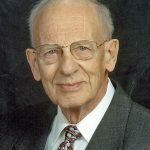 He practiced medicine at Rohlf Memorial Clinic from 1954 until his retirement in 1994. He was a member of St. Paul’s Lutheran Church in Waverly. His practice was his greatest passion and he enjoyed growing tomatoes. Survivors are his wife, Joan Hanson of Waverly, Iowa; and two daughters, Jean Hanson of Minneapolis, Minnesota and Joan Hanson of White Bear Lake, Minnesota; niece, Anne Ditmanson and her husband, Damian Bursill-Hall; nephew, Mark (Janet) Ditmanson and their children, Alexander and Daniel; great niece, Amanda (Tyler) Wycoff and their children, Elliott and Brady and great niece, Laura Peterson and her husband, Hollis Roads. He was preceded in death by his parents; sister and brother-in-law, Jean and Harold Ditmanson; nieces, Barbara Ditmanson and Mary Peterson and great niece, Stacy Peterson. Funeral services will be held on Thursday, March 16, 2017 at 1:00 pm at St. Paul’s Lutheran Church in Waverly, Iowa with Pastor Arthur Bergren officiating. Burial will follow in Harlington Cemetery in Waverly. Friends may call from 12 Noon until the time of the service on Thursday at the church. Memorials may be directed to either St. Paul’s Lutheran Church of Bartels Lutheran Retirement Community and online condolences for Henry may be left at www.kaisercorson.com. “Henry Hanson Obituary,” Kaiser Corson Funeral Homes, Inc., accessed July 7, 2018. http://www.kaisercorson.com/obituary/Henry-Morley-Hanson/Waverly-IA/1707801.